As I usually do in any note to all of you, I’d first and foremost like to thank you all for your trust in providing the news of your community, and for your great support of our site. Our stellar island business community, likewise, has made Shorebeat a success over the last two years. We don’t receive too many complaints, but one I’ve fielded a number of times is that our site is not easy to read on mobile phones. Indeed, about 60 percent of our traffic comes from phones, so this has always been a concern. The platform on which this site runs does support an optimized view for mobile devices, but in the past we have not activated it for two reasons. First, we felt the navigation capabilities were not well defined, and the look of the site did not transfer well. More importantly, we felt that our advertisers would lose out on some views of their ads because they would be pushed to the bottom of the page. Had we moved the ads to the top of the page, they would have been too intrusive. When we launched our Toms River Shorebeat site last month, we began testing some new “underpinnings,” so to speak, that we thought might solve the problem. The new design looks nearly identical on desktops and tablets as the current design, but its mobile version truly retains the look and feel that we want to project. Additionally, the new system will allow us to mix the advertising that keeps us in business “inline,” meaning they will be inserted into the content in a way that is noticeable, yet does not take away from the experience of the reader. 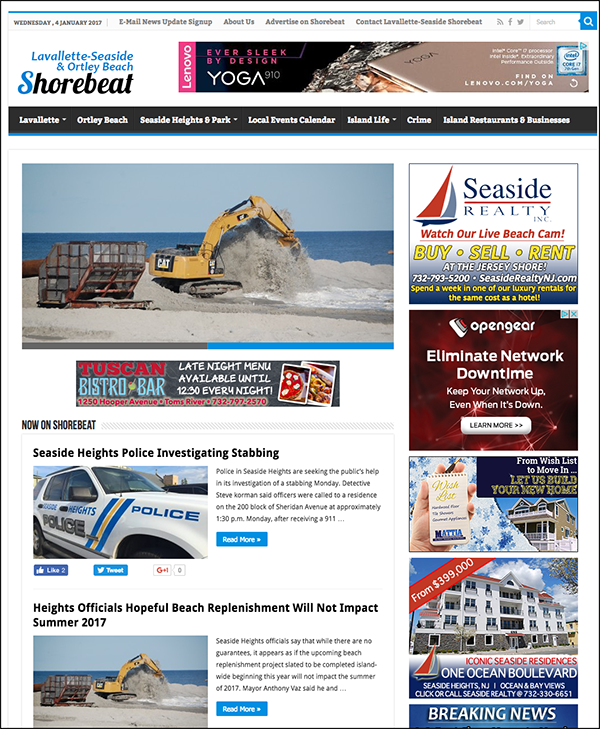 The response from the new site has been overwhelmingly positive, and we have made the decision to migrate our first two sites (Brick and Lavallette-Seaside) to the new design over the course of the next week or two. I wanted to reach out to everyone to let you know that the design will be slightly changing, although for desktop readers it remains 99 percent the same as the current site. For mobile readers, the text and headlines will be larger and you’ll be able to read our site (as well as our messages from sponsors) in a friendlier format. As with any change, there may be a glitch, or three, during the process. If you spot something out of place, please go to the “Contact Us” page and fill out the form, which will be e-mailed to me, or just give me a call. For a preview of what the new design looks like, please visit our Toms River site. Again, thank you so much for your support, your trust and your readership over the past two years. We hope the change will be a positive one for you (and your previously-strained eyes).